We had a few more thunderstorms yesterday, with a handful of areas (but a fair amount of population) seeing some rain. We may repeat that today before drier weather returns for the weekend. As for the Fourth, well, it’s going to be a close call. There should not be much weather to speak of this weekend. It will be dry and hot. Look for high temperatures in the mid-90s on average. Monday may end up being the hottest of the three days, and I wouldn’t be surprised to see Houston register a 96 and 97 by then. Rain chances are almost never zero in Southeast Texas in summer, but this weekend will be close. We don’t expect much in the way of afternoon showers, even on the sea breeze right now. We’ll continue to deal with dusty skies, which could again degrade air quality in Houston, so take it easy if you’ll be outdoors. I know this is Texas and most of us are used to the heat, but, coupled with the haze and dust, this weekend will probably feel just a tinge worse than usual. Drink plenty of water, take it slow, and check up on anyone you know that may be vulnerable in the heat. Good morning. Yesterday was the 16th day this month that we officially hit 95° or hotter in Houston. The last time we did that was 2013. At least this isn’t a repeat of 2011, when we did 95+ on 26 occasions. We will continue to flirt with 95 degrees for the final three days of June. More on that in a second. Below today’s forecast, we’ve got some analysis on the National Weather Service post-Harvey service assessment that was released last week. I farmed out some interesting tidbits for you that may be of interest. First, the forecast. More hot weather is in store for us over the next couple days. We had a handful of showers in the region yesterday, and we’ll probably have a handful more today. However, atmospheric moisture looks a bit more robust today than it did yesterday, so that should yield a slightly larger handful of showers than Wednesday. That said, we’re talking like 20 percent chances at best here. Basically, if you see a cooling shower today or tomorrow, consider yourself fortunate. Temperatures will peak around the middle 90s once again both Thursday and Friday. Shower chances continue to look like they’ll dwindle to near zero this weekend. With that, expect more hot weather. Officially, high temperatures should reach the mid-90s both Saturday and Sunday. Take it easy outdoors, as it will continue to be quite humid and uncomfortable. As noted yesterday, we will also be dealing with Saharan dust. Skies will be hazy or gray looking at times, despite sunshine. And again, if you have any respiratory ailments or bad allergies, you may want to take it a little extra easy this weekend, as air quality could be a little worse than usual. Just to clarify, as we’ve gotten a handful of interesting questions, this isn’t a dust storm or big, unique event for us. This happens at least a few times a summer usually. The vast majority of us will notice more haze than usual and the color difference to the sky. Maybe, if we’re lucky, the sunsets and sunrises will be more vibrant, though I’m happy to put a Texas sunrise or sunset up against anyone’s on a normal day. Sometimes, too much dust can have the opposite effect and dull the sunsets or sunrises a bit. The only real “impact,” per se, is the slight increase in particulate matter, which is why if you have bad allergies or other respiratory ailments, we encourage you to take it easy. It’s certainly meteorologically interesting and a nice reminder of how fascinating this marble is that we inhabit to realize that you’re seeing dust in the sky in Texas that’s come all the way from Africa. We do still look to be on track for a change next week, though the details are very uncertain. We’ve got high confidence in Monday still looking a lot like the weekend, with some haze and plenty of heat and humidity. 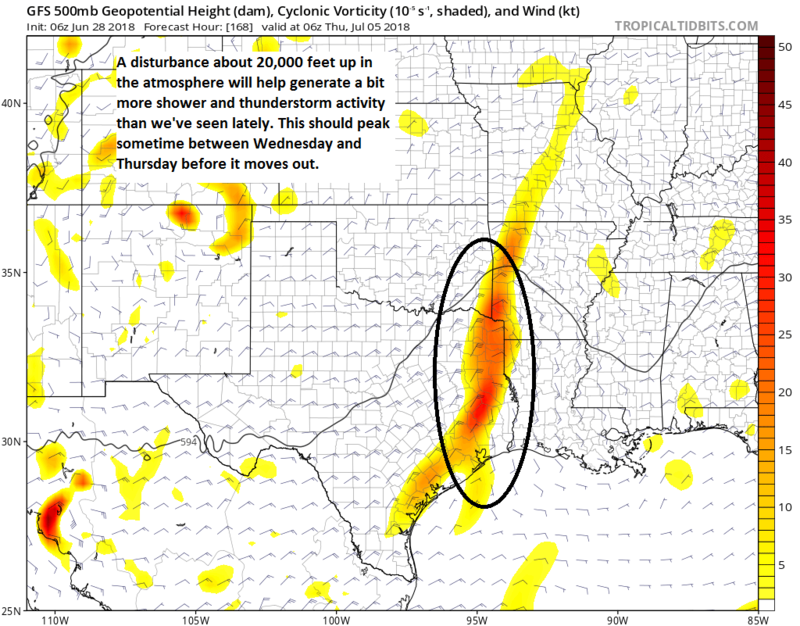 By Tuesday, a disturbance aloft will be approaching western Louisiana, perhaps generating slightly better storm chances east of Houston toward Beaumont or Lake Charles. After about Tuesday afternoon, forecast confidence trends downward. Wednesday will probably see our storm chances peak in the Houston area and just east, but depending on the speed and trajectory of next week’s disturbance, that could easily get pushed back to Thursday. So before you go cancelling any plans, just know that as of right now we don’t expect a washout on the Fourth of July yet, just a better than average chance of storms. That said, yes, if you have outdoor plans you want to stay tuned to the forecast, as this could shift one way or another pretty easily. More on this tomorrow. Eric noted yesterday that we haven’t hit 100° yet in Houston this year. Despite that, if the month ended yesterday, we would have one of the ten hottest Junes on record in Houston. Even without real extreme heat this June, it has been a mostly sustained hot month. We’ll close the book on June next week and have more numbers for you then. Meanwhile, let’s talk some slim rain chances, dust, and the chance of a pattern change next week. By no means are today, tomorrow, and Friday going to be considered really stormy days here in Houston, but they may represent our best chances for a smattering of showers or a few thunderstorms until next week. All three days should see at least a handful of showers on the radar from mid-morning through mid to late afternoon. Thursday has the better chance of the three days. But consider yourself lucky if you get a cooling downpour, as many folks will likely stay dry through this period. Expect high temperatures to peak in the lower to middle 90s both days. AM lows will likely hang in the mid- to upper-70s. Hot: That about sums up this weekend. Expect sunshine and heat, with storm chances about as close to zero as you can get this time of year. There’s always a chance a rogue downpour could pop up, but it will be decidedly hot and dry. Take care and drink plenty of water if you’ll be outdoors this weekend. And just to add to the allure, it will be dusty and hazy. 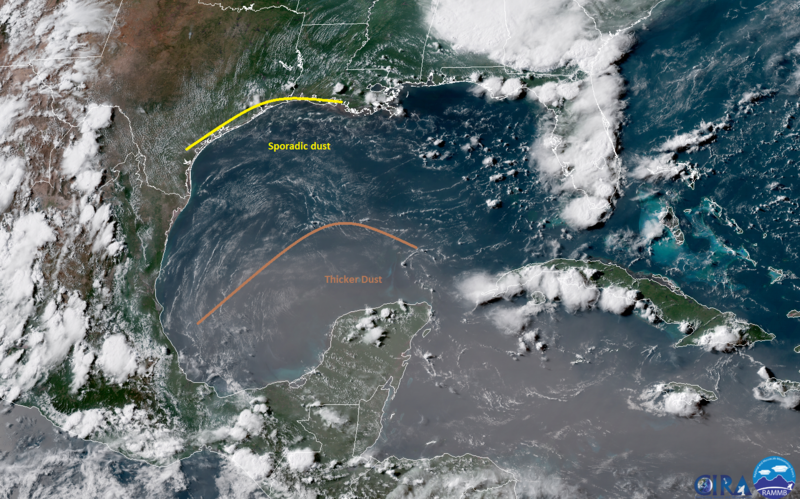 The leading edge of a Saharan dust plume from Africa will make it to Texas this weekend, giving the sky a milky, hazy, almost grimy appearance at times. It may also make for interesting sunrises or sunsets. If you have any respiratory ailments, it may not be the worst idea to take it a little extra easy this weekend too. Expect the dust to perhaps be noticeable as early as Friday, but much more obvious on Saturday. I’d expect mid-90s for highs both Saturday and Sunday, along with nighttime lows in the mid or upper-70s once more. 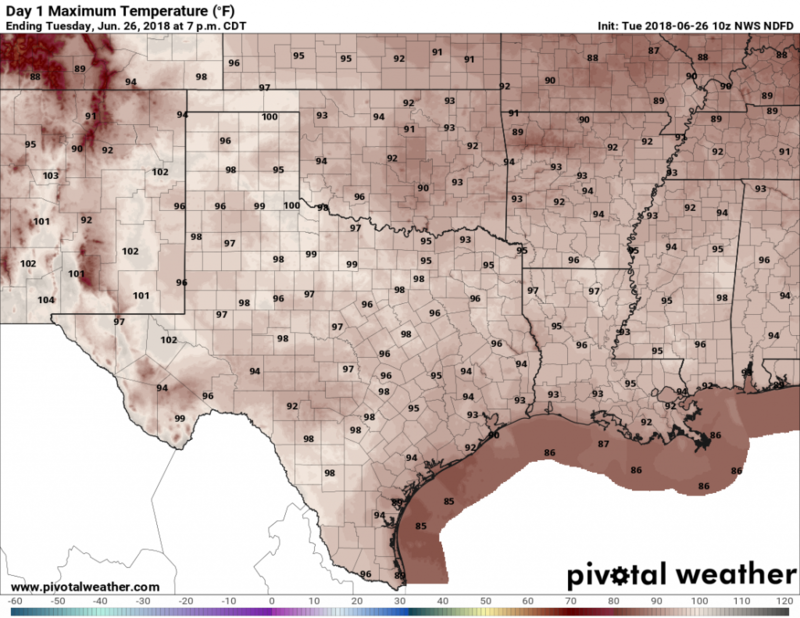 The absence of 100-degree days in June is probably a decent sign for the rest of the summer in terms of extreme heat, but alas there are few guarantees when it comes to weather. Moisture levels are lower than Monday, so I expect few if any rain showers across the metro area today. Most probably, we will see hot and sunny conditions with high temperatures in the low- to mid-90s. If you picked today to skip work and head for the beach, you made a good choice weather-wise.